Food Costs > How Much Does a Lobster Cost? How Much Does a Lobster Cost? Lobster can be used in soups, bisques, as a lobster roll or just simply dipped in butter. Lobsters are found in all oceans and live in the sandy or muddy bottoms of the shoreline, feeding on worms, plants and other fish. In general, a lobster can grow up to 20 inches long and can reach speeds up to 11 miles per hour. How much does lobster cost? The cost of a lobster will depend on where it’s purchased from, the size, quality, geographical location, how it’s processed (fresh or frozen), time of year and market conditions. On average, plan on spending anywhere from $8 to $19 per pound at the grocery store. Generally, the further you live away from Maine, the more you will pay at a local retailer or even online. At most stores, a lobster will be in the one to four pounds ranging, meaning, the average price will be anywhere from $8 to $60+ for a lobster. However, you can find jumbo sizes online, weighing as much as 12 pounds or more. At Publix, for example, the price for lobster, as of 2017, was $16.99 per pound. The Yankee Lobster Company offers prices on its official website. At the time of writing this guide, a one-pound lobster can cost $10 per pound, while a jumbo, which will weigh more than six pounds, can cost $8.99 per pound. If you want to purchase the meat already prepped, frozen and ready to go, the prices can be much more. Mixed lobster meat can cost $45 to $65 per pound, while the tail meat only can be $50 to $70 per pound. Every five pounds of lobster yields about one pound of meat. Lobster tails, which usually weigh about four to five ounces, can cost $8 to $15 each. Some retailers such as Sam’s Club may price it by the pound; in this case, it can be in the $50 per pound range. No matter where you purchase a lobster, you’re going to find two species: the spiny lobster or Maine lobster. A spiny lobster, which has a distinct white spotted pattern, will have no claws and will come from the warmer Caribbean waters. If you’re solely buying the lobster tails, there’s a good chance it’s coming from the spiny species. A Maine lobsters will come from the colder Atlantic waters, and most of the time, they will be sold live. Aside from the species, there are two types: a hard shell and a soft shell. As a lobster grows, it will shed its shell, revealing a softer shell beneath. As they puff with new water, it will stretch out the newer shell, effectively, hardening again. This process will occur once per year, usually around July until December. A softer shell, of course, will be softer and the meat, at least according to The Food Republic, will be sweeter, but it won’t be as hearty. Lobster can be purchased at your local grocery store, directly from the fisherman at the dock, online or a specialty fish market. Regardless of where you purchase it, lobsters will be held in large aerated tanks to keep them as healthy as possible. Since soft shell lobsters are hard to ship across the country, buyers often have to purchase online. Due to the sensitivity in shipping, expedited shipping is a must, often resulting in a higher shipping fee, especially if you don’t meet the minimum spending requirements. Shipping can be in the $25 to $35 range. When you cook it, a lobster should always be cooked live. Once killed, a lobster, according to Serious Eats, will become a crustacean zombie due to the fact it digests its prey via the enzymes in their upper digestive tract located inside their heads. Once killed, this can result in a mushier meat inside the tails in a matter of hours. If killed and shipped frozen, the tail and claws will often be removed and will be immediately frozen. This is why you will rarely see live lobsters sold frozen. A healthy lobster, when purchased, should be able to lift its claws, raise its tail and move its legs energetically. Any lobster with limited movement should be avoided. Close to 80 percent of the lobster you see will come from Maine and will be in the form of a soft-shell lobster during the summer and fall months. A good lobster will not have an odor. Once purchased, it’s always best to eat it immediately. If not fed, a lobster will start to feed on its fat storage as a means of survival, effectively, losing its body weight. If you want to know if a lobster has been in a tank for a long time, pay close attention to the lobster’s antenna. As time goes on, other lobsters will eat the antennae and can nibble it right down to the base. A lobster with a longer antenna will mean it hasn’t been in the tank as long as the others. Chefs recommend steaming instead of boiling to keep a sweeter taste and retain more of the flavor. 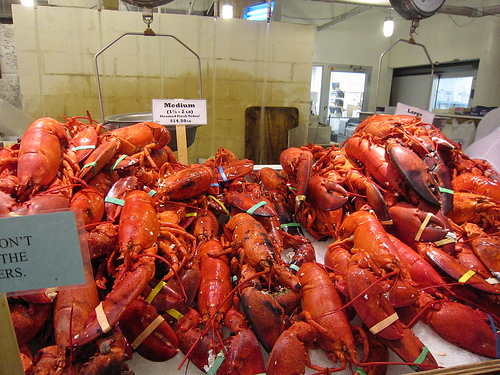 If you want the cheapest lobster possible, visit the coasts of Maine and find a local market near the docks. Here, you can often find lobster for as little as $3 per pound. Grocery stores, like most of its items, commonly put lobster on sale. If you have a handful of stores in your area, check the circular ads to see if any of these stores are holding a sale. Lobster, when purchased near the coast, will always be the cheapest from June to September when in season.